District 1 Meeting Member Rusty Sage listens to debate on the school budget. BRATTLEBORO—The annual Representative Town Meeting zipped along — by local standards — on Saturday. Town Meeting members approved all but two of the 26 binding agenda items, including the municipal and school budgets as presented, along with other spending. They defeated, yet again, a proposal to enact a 1-percent local option sales tax as a new revenue stream. And members approved some crucial infrastructure repairs. Topping the list is the Green Street retaining wall, which is failing and threatening to take Green Street with it. 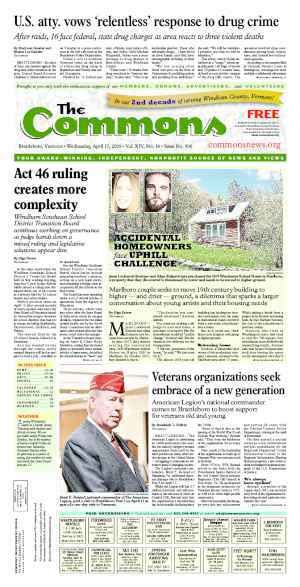 Concerns that underscored many of the members’ discussions at the eight-hour meeting included Brattleboro’s struggles with poverty and its proximity to sales-tax free New Hampshire. As they deliberated in the Brattleboro Area Middle School Multipurpose Room, meeting members passed the municipal operating budget of $15.5 million. Fiscal year 2016 will have no tax increase, compared to the current fiscal year. Selectboard Chair David Gartenstein told the body that after removing bond interest payments to the Police-Fire Facilities Project and other savings on expenses, such as purchasing heating fuel at recent lower rates and moving to a new trash disposal system, the Selectboard realized the tax increase sat close to zero. The board decided to go all the way and ensure taxes stayed steady, Gartenstein said. The Selectboard decided to propose using $96,265 from the town’s unassigned fund balance to offset the amount to be raised through taxes. An amendment by a Town Meeting member to increase the budget by $96,265 — and thus preserve that amount in the town’s savings account — failed. After some discussion, members approved $20,000 from the unassigned fund balance to support a feasibility study for a town skatepark. The park is slated for an area in the upper part of Living Memorial Park. During the decades-long saga of finding a location for a town skatepark, nearly every piece of possible land has been investigated, including the West River Park, the Crowell Lot on Western Avenue, the Elm Street parking lot, and three locations at Living Memorial Park. Some Town Meeting members questioned the use of tax dollars to fund a study for a skatepark. Those speaking in favor of the funding stressed that the money would — finally and substantially — allow the project to move forward. Meeting members approved spending $485,000 from the unassigned fund balance to fund urgent repairs to four pieces of infrastructure and roadways. The funds will most urgently fix the Green Street retaining wall. Other needed fixes include the Elliot Street bridge, which is down to one lane due to a hole in the bridge deck; the Municipal Center, which requires state-mandated safety improvements, such as adding sprinklers to parts of the building; and a redesign of the Union Street/Western Avenue intersection to make it safer for pedestrians and motorists. The board and town employees anticipate fortifying the $485,000 with grant monies. Meeting members approved $632,000 in capital spending to replace two police cruisers, a 20-year-old road grader, and a 22-year-old dump truck. The town will finance the purchases over five years. An article that called for $120,000 to support 26 human service organizations passed unanimously. However, meeting members briefly discussed whether the Representative Town Meeting’s method for allocating the human-services funds was as efficient as possible. Meeting members approved funding for two longstanding special tax assessments. The first assessment, totaling $78,000, is on 80 downtown property owners or corporations within the Downtown Improvement District (DID). Towns with a state-approved DID are eligible for additional grant funding and tax credits. The second assessment, totaling $223,276.48, is a tax assessment on properties in Mountain Home and Deepwood Mobile Home Parks. The money funds debt payments on improvements to the water and sewer lines. Brattleboro Climate Protection will receive $10,000. Town Meeting Member Tad Montgomery asked the Selectboard to consider making the role held by Paul Cameron at Brattleboro Climate Protection a full-time paid staff position. Climate Protection’s role continues to grow and the group’s efforts have “saved tens of thousands of dollars and we’ve really only scratched the surface,” Montgomery said. Members defeated a proposed 1-percent local option sales tax, 78 to 44. Town Meeting members had defeated the proposal for the voluntary tax at previous meetings at least twice. In a non-binding town-wide vote earlier this month on the election ballot, voters also rejected the notion. Initially, the tax found its way onto the Representative Town Meeting agenda because the board had anticipated moving forward with the Police-Fire Facilities Project, and the tax might have raised $600,000 toward the project. But with the project’s funding on hold, due in part to a ruling by the state bond bank, the tax lost its purpose. Meeting Member Kurt Daims tried to move the question before the start of debate, but the body opposed this measure. Meeting Member Peter Cooper said that enacting the tax would spread the financial burden of financing the town to visitors and commuters. Meeting Member Christopher Chapman, who has served on the Selectboard, said he reversed his decision on the tax. As a board member, he voted in favor of it. Now, he has witnessed local businesses struggle to compete against companies that can offer cheaper deals on the Internet. “I think it would be a mistake to see this as low-hanging financial fruit for the town,” said Chapman. Some meeting members also asked for reassurance from the Selectboard that it planned to continue the Police-Fire Facilities Project. The controversy around the project has centered on the issue of affordability. The majority of the Selectboard supports rehabilitating the three emergency services stations that have developed issues like mold, inadequate ventilation, and other life-safety issues. A number of meeting members have also shown support for the controversial $14.1 million project. They say the community can’t afford to have its emergency services personnel operating in unsafe buildings. The projects’ opponents, however, stress the danger of the tax hike associated with the project. The community is already struggling financially and can’t afford such an expense, they say. Upon questioning, Gartenstein said the project would continue. But as to what schedule or how it would proceed, “a final decision has not been made,” he said. “It’s a big-ticket item remaining open on the Selectboard’s plate to be dealt with going forward,” he said. He anticipated that meeting members will attend a future Special Representative Town Meeting to decide how to go forward with the project and to approve costs. The town schools’ $15.4 million budget passed overwhelmingly as presented. This budget funds Brattleboro’s three elementary schools and Early Education Services. Although the budget decreased slightly at the local level, calculations in the statewide formula will result in a 2.6 cent tax increase for the fiscal year 2016 school budget. This increase is equivalent to $44 on a house valued at $100,000. School Board Chair Jill Stahl-Tyler said the board felt happy with the budget. The board had asked the administration to develop a budget with no tax increase, though this didn’t quite happen. Cutting line items further would have resulted in deep changes in programs offered to students, she said. “We didn’t like the answer and we didn’t think you would, either,” she said. Meeting members questioned what the School Board did to materially lower expenses. “What we could do to lower this budget even more?” asked Town Meeting Member Rusty Sage. Sage, a parent and firefighter, remarked that the school budget traditionally passes easily while the municipal budget receives intense scrutiny. The board and administration said they questioned the need for expenses like school computers, crossing guards, busing, textbooks, chairs, the Gifted and Talented Program, arts programing, and foreign-language classes. They contemplated cuts to those expenses, and realized that they would “have a whole different school system if that were the case,” said Superintendent Ron Stahley. Brattleboro faces the same decline in student enrollments as many Vermont schools. According to Stahl-Tyler, the number of kindergarten students in the town school system has dropped by 32.
Business Administrator Frank Rucker explained that the Windham Southeast Supervisory Union controls a small portion of the budget compared to expenses that are mandated by the state and federal government. The supervisory union found savings within expenses that it could control, like in utilities. Staffing levels represent an area where the Brattleboro Town School District might reap savings but also where it struggles to do so, he said. The state education funding formula responds quicker to student enrollments than school systems can, said Rucker. To maintain certain programs and support students, the schools maintain a student-to-teacher ratio of 20 to 1, he said. Yet a loss of 10 students might not be enough to allow the school to release a staff member and maintain a proper student-to-teacher ratio or preserve mandated programs. Yet a loss of 10 students can greatly increase the education tax rate, Rucker explained. The discussion also raised some more philosophical questions. Is Representative Town Meeting the venue for making changes to the school budget, or is March too late in the process for substantive changes? Do Meeting Members need to start asking their questions earlier — like when the School Board starts building its budget? Poverty also wove itself through the discussion. According to numbers from the School Board, more than half the students at the elementary schools qualify for free or reduced-price lunch. Green Street School has the highest percentage of students qualifying for the federal program at 70 percent. At last count, 15 elementary school students were homeless. Educating and caring for students living under the stresses of poverty takes more resources, said members of the School Board and school administration. “Poverty is what’s driving these costs,” said Schoales. 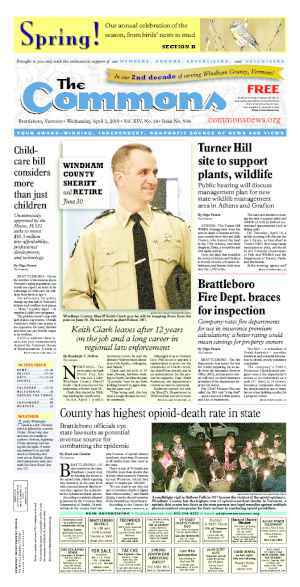 • Meeting members took the first of two steps in the process of approving charter changes that were requested by Town Clerk Annette Cappy. The first charter change consolidates deadlines for incumbent and new candidates for Representative Town Meeting to submit their candidate petitions. The second would allow the use of voting tabulation machines in the Town Clerk’s office for early voting. To receive final approval, the proposed changes must receive a second affirmative vote at an upcoming Representative Town Meeting. • Meeting members defeated an agenda item to establish a Committee of the Future. Many of the meeting members who spoke to the issue felt confused about what the committee would intend to accomplish and how it would fit within the local governance structure. • Robert Fisher of Fisher and Fisher was reconfirmed as town attorney. 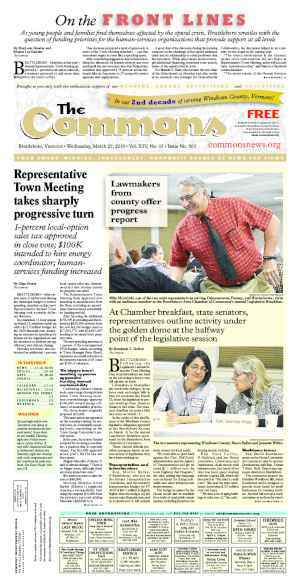 • Town Meeting Members Georges Herzog and John Wilmerding were confirmed to serve on the Capital Grant Review Board. • Adam Franklin-Lyons, Robert Stack, Susan Troy, and Debra Loevy-Reyes were named Brooks Memorial Library Trustees. 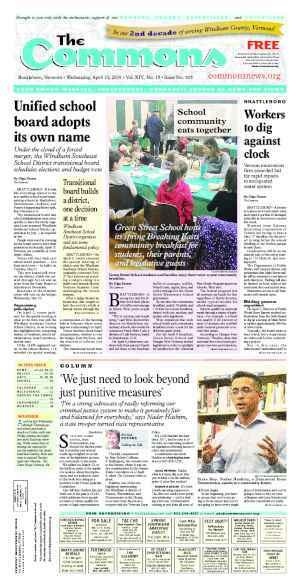 • School Board and Selectboard Member David Schoales put forward, and the body approved, a non-binding resolution that takes a stand against the Vermont State Board of Education’s plans to consolidate school districts. According to Schoales, communities like Brattleboro will lose control over their schools if the state Legislature passes its big education bill, H.361, this session in its current form. The bill, he explained, would consolidate multiple school districts into a handful of larger ones. Effectively, he said, the bill will eliminate Brattleboro residents’ and meeting members’ voices in determining the budgets of their local schools. Meeting Member Donald Webster echoed Schoales, saying that the power to drive education quality will move up the ladder from local communities to the state Board of Education. In some cases, consolidation creates good results, but not this one-size-fits-all approach of the proposed legislation, said Webster.